These are hard to tell from the original Redlines if installed properly. We accept credit cards, Pay Pal, money orders and cashier checks. We accept credit card payments only through PayPal! Any marketing,reproduction or copy of similar characteristics and distribution of the Infringing Products violates southern customs exclusive rights. O Southern Customs trademarks are not affillated with Mattel or Redline.. This Size Fit The Large Rear Wheels On The Old Original Redline Wheels and Most Current Wheels. This Is The Most Commom Size! This Size Fits Most Rear And Alots Of The Front Wheels On The Old Original Redline Wheels. This Size Fits The Smaller Front Wheels On The Custom Volkswagon,Custom Mustang,Custom Barracuda,Classic '36 Ford Coupe,Classic '57 T-Bird,Custom Cougar,Custom Firebird,Beatnik Bandit,Silhousette And Many Others On The Old Small Original Redlines. Only $3.80 A Sheet on Lots of Ten! That's Enough To Do 70 Cars!! Buy 10 Sheets . $38.00 Shipped! 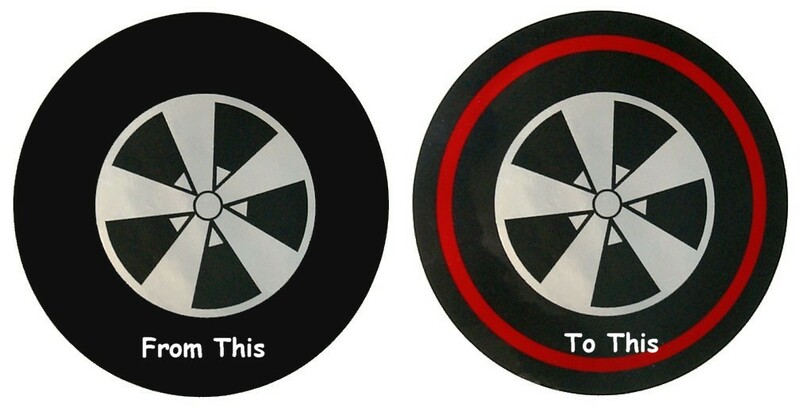 "These Will Fit All Original Redlines Wheels"
"One Sheet will do 28 complete wheels for Cars,Trucks & Vans"
We have the best redline wheel decals Tm produced. We guarantee it. Plus there is no need to remove the wheels or take the car apart!! These are a dream come true for the Redline restorer. These will make your old wheels come alive. If you are a Serious Restorer you will love them. I have sold hundreds to professional restorers, clubs and people just like you wanting to restore their own cars. 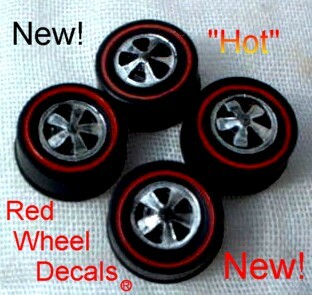 These looks very close to the original redlines, Which have self sticking adhesive on tha back. These are hard to tell from the original Redlines if installed properly. Please don't use these to sell fake cars to someone! Remember what goes around comes around. These are intended to help cut cost for you the collector. Southern Customs in no way will be responsible for any user who makes Fake cars for resale. There is no need to take your car apart or remove your wheels! Just line them up and press them on, That it!! If You Don't See The Size You Need Email Me What Size Wheel You Are Looking For And We Will See If We Can Make It Happen.